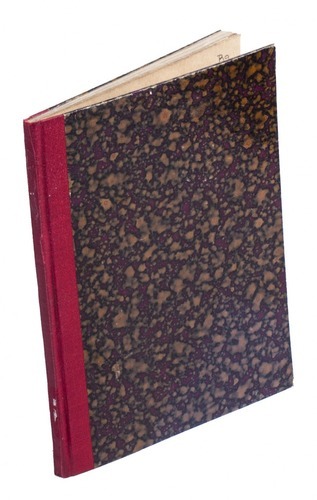 Offentliche Bekentnis der reinen Lehre des Evangelii, und Confutatio der itzigen Schwermer. ... Item ein Register Illyrici, etlicher bittern unwarheiten Menii und anderer. Jena, Thomas Rewart, 1558. Small 4to (18.5 x 14.5 cm). With two woodcut initials. Modern half cloth. 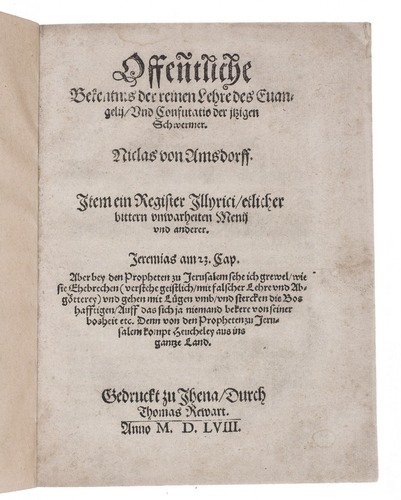 First issue of the first and only edition of a pamphlet on the "true Evangelical doctrine", by the German Lutheran theologian and reformer Nicolaus von Amsdorf (1483-1565). 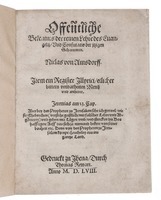 The pamphlet was published after Johann Pfeffinger held two disputations on the nature of free will. This pamphlet "... reproduced Pfeffinger's teaching in distorted form, maintaining that Pfeffinger and his colleagues had taught that human beings can prepare themselves for grace by their own free will and situate themselves so that God can give them grace..." (Kolb). 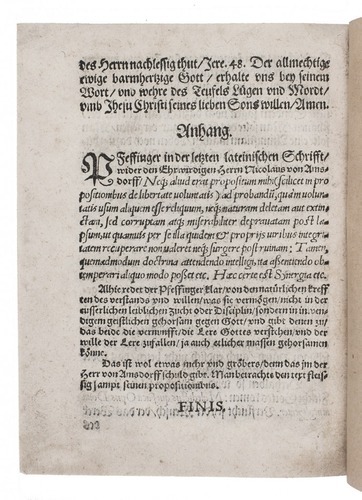 The text is followed by a section against the "bitter falsehoods" as believed by Justus Menius (1499-1558) and others. Included at the end is a brief and sharp reply by Pfeffinger. A few marginal water stains, otherwise in very good condition. Kolb, Lutheran ecclesiastical culture: 1550-1675, pp. 47-48; VD16, A2381 (A2382, the second issue).